Which shopping mall do you think has the best feng shui in the Klang Valley? I think it is Mid Valley as it is always packed with people. Go there later than 11am and you will have a hard time finding parking space. Although other shopping malls like 1Utama or Sunway Pyramid also suffer from this parking problem, they are limited to the weekends. And guess what really convinced me that Mid Valley Megamall and its surroundings have good feng shui? Well, you can't go wrong when two of Malaysian's most well known feng shui practitioners set up their offices in Mid Valley City. Yes, I am talking about the infamous Lillian Too and Joey Yap. 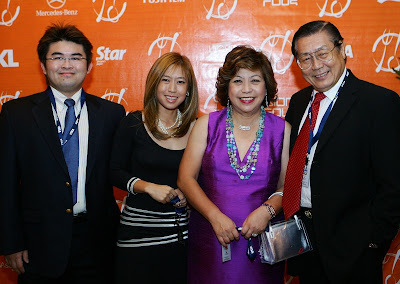 Two Sundays ago, I attended Lillian Too's Feng Shui Extravaganza at KL Convention Centre. And last Saturday, my brother attended Joey Yap's Feng Shui seminar also at the same venue. In case you think me and my brother are feng shui fanatics, let me assure you we are not. I do believe in feng shui, and I do practise it, but I am not obsessed with it. Not everyone agrees with Lillian Too on her suggestion to have feng shui cures and enhancers. Some think she's marketing her products when she encourages people to get those feng shui stuffs. If you are one of them, you will probably be better off attending Joey Yap's talk as Joey does not sell any feng shui remedies. Well, whether you agree with her or not, you cannot deny that Lillian is a good speaker, great at motivating people, and is definitely brilliant in marketing herself and her business. She has a very impressive stage presence as once she stands on the stage, all attention goes straight to her! I enjoyed her talk a lot as I found it entertaining. That's because she threw in lots and lots of jokes! Here's one joke that kept the crowd in stitches. Lillian mentioned that she used her feng shui enhancers ( I forgot which one!) to attract more friends. She boasted she had so many friends she had a hard time catching up with all of them. In the next sentence, she quickly said, "But of course I sign up for Facebook and my friends multiplied overnight!" or something to that effect. Haha! That's funny, no? Another joke that had me laughing was when she said she once suffered from a back problem every morning when she wakes up from her bed. So to cure it, she placed lots of metal objects in her bedroom which according to her, would help to improve her health. The next morning, her back pain miraculously disappeared! In the next breath, she said "But of course, I took the painkiller lah..." Haha! She's one funny lady! If you like to know more interesting facts about this incredible lady, read more here. So would you like to know what's in store for the Year of The Ox? According to Lillian Too, the year of the Ox promises respite and recovery from the economy downfall that hit us last year. Although there will be more bad news coming, overall the year of the Ox will be more stable. This is especially so in Malaysia as we are very fortunate to be located in the South East, as this sector will be protected from the economy instability this year. Lillian Too advised us not to be too overly concerned with bad news coming from the USA, as although USA would be hit hard economically, Malaysia would not be dragged along with it. That's good news, yes? The reason for this positive outlook is due to the presence of all the five elements in the Bazi Chart. The three Yang and one Yin pillar also indicates strong Yang energy. Although there are opportunities, do be careful. Attention should be focused on preserving your current wealth than trying to make quick money. This is the year to strengthen your financial situation to prepare yourself for more coming challenges beyond 2009. Yes, 2010 is not a very good year, it seems. There would be a continuation of natural calamities due to the Dominant Earth. Be health conscious as there is danger of sickness and epidemics. Here are some predictions for the different industries. Metal Element Businesses (eg. mining, jewellery, computers, airlines) - Since there is plenty of earth to fuel metal, those involved in this business should think big and take risks. The first quarter of the year will be an excellent year for this industry. Earth Element Businesses (eg. property, real estate, construction, hotels) - Will be doing well the whole year, but should do planning before investing. Fire Element Businesses (eg. stock market, entertainment, lighting, restaurants) - Since there are plenty of wood to fuel fire, those involved in this industry should think big and make big gains. However, they do need to watch timing. The second half of the year will perform better compared to the first half. Wood Element Businesses (eg. plantation, agriculture, publishing, education) - Not a good year. Only the best will survive. Some may need to close. Should consolidate to stay afloat! Water Element Businesses (eg. banking, shipping, transport, alcohol, fishing) - A difficult year of crisis situations. Would need strategies to survive as weak companies will collapse. I am not going to touch on the prediction of each animal year as you can read that here. However, they are very general in scope. To really know with accuracy, you will need to have your Bazi interpreted by a Bazi practitioner. And to know which sectors in your home is good and which you should try to avoid, read here. Well, if you like to know more, catch her on Astro TV channels Hallmark (702), CNN (511), Starworld (711) & Asian Food Channel (703) in the months of January and February. For the exact time, click here. Next up, I shall post on what Joey Yap said....so stay tuned! I watched her show in Astro a couple of yeasrs back. She is entertaining, but I do feel that she is also trying to market her stuff too. There was a newspaper article about Mid Valley's feng shui. About how the Klang river, the Indian temple and the circling traffic all helps boosting the mall's feng shui. Must be true since it's always packed even during the weekdays! I hate going there during the weekends. All you see are people and more people! Property industry will be doing well!?? Hotels are also likely to see lower occupancy rate as people and companies cut spending. Well I am an MBA student so I see it from another perspective. Most important believe in yourself and what you can do. You got to plan and you work your plan. Plan realistically and you can achieve it because your mind works for you. What you put into it will be will be end result. Positive thinking is necessary in our daily life. lina, she's definitely trying to market her stuffs. Some people don't like that, but I'm used to it so it does not bother me too much. I went to her talk just to gain some knowledge and have a good time! Haha! Hi... Did Lillian Too mentioned which are the auspicious good days to start work? Im looking forward for the Joey Yap from you.. hehe..
For me Lilian Too can be very convincing just because of her marketing skills is soo soo powerful. That's how she make business. Of course applies some facts also la. I agree, Lillian Too is funny even in her writings. I guess that is why she's popular. I'm looking forward to your post about Joey Yap. Feng shui says the best location for a house is a hill behind and a river in front...but these days, I really wonder. May end up becoming the victim of a landslide and with the bank erosion, the house may just collapse into the river. So much for feng shui!! Hahahahaha!!!! Aiya, Fishing also difficult this year ah? Have to hang up my fishing rods already lorrr! I hope this year will be better as she says. I had never heard of these Feng shui people until now. Hehehee... I look at the practical side of feng shui and that's about it. Otherwise, I still believe that although we all crave for divine intervention in everything we do, come to think of it, the rest is up to us, right? BTW, KONG HEI FATT CHOY!! quachee, I don't think that's true, just take a look at Lillian Too and Joey Yap - they are both making lots of $$$! But I do know that if you give feng shui advice without charging a fee, you will get bad luck. It happened to me once - I analysed the feng shui of a friend's house many years ago, and I did not charge her anything. When I left her house, I got involved in an accident! I didn't know at that time, but after I learnt about this, I never do any free consultation for people any more. LOL! That is why Lillian and Joey only give very generalised advice in their public talks. If you want to go for your specific feng shui analysis and advice, you will need to pay them to do a proper consultation. Lillian Too? Hmm...she's very smart I have to say. She capitalise on this whole Feng Shui idea and made lots of bucks at the believers expense! =/ I don't know what else to say. Sometimes I think lilian too is too fake for me. I heard from a friend saying that she is divorced and the husband standing next to her is just for showing to ppl how happy she is. Also, I read from a magazine saying that she has high blood pressure/ diabetes. Just wondering why didn't she use her feng shui to cure her health.. If talking abt fengshui, I would go for Joey Yap. Keep it up Joey! "I feel I was being cheated by Lilian Too when I bought Lillian Too's Feng Shui Kit and it does not offer how to use them and her explaination vague." anonymous, thanks for your comments, although I'm sorry I'm late in replying - like 4 months late! Haha! I heard all those rumours but I don't care too much. Cos famous people always have good and bad write-ups. I am just interested in learning more from Lillian Too, that's all. are some of the hottest tickets to wind up 2009 and will surely only rise in popularity in 2010. "Sorry, We Don't Accept Credit Cards"